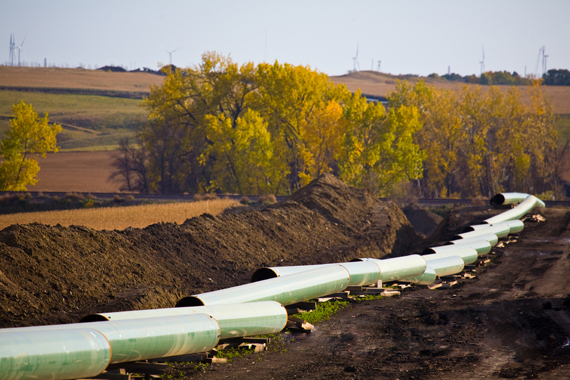 Whatever has happened to the Keystone XL pipeline proposal after the President's veto? Apparently, it is still being reviewed by the State Department and a final decision could come at any time. It is time, my friends, for people to do real cost accounting. The bottom line is that we can't only factor in the price of immediate energy needs. We have to include the long-term cost of carbon pollution. Good point! Curiously, such analysis is barely present in the State Department's own assessment -- Final Supplementary Environmental Impact Statement (SEIS). So here is some help. According to the SEIS the construction phase of the project, expected to last a year or two, will contribute $3.4 billion to the U.S. economy. While these numbers are surrounded by controversy, let us take them at face value. Once complete, the pipeline will generate annual tax revenue of $55.6M of direct benefit. Operating the pipeline is going to require about 50 jobs (35 permanent and 15 temporary positions). Using an average salary of oil n' gas pipeline jobs of about $85K per job, we get an additional indirect benefit of $4.25 million annually. (There are other benefits and costs, but in the absence of total cost accounting, we keep our focus on governmental costs and benefits.) So the pipeline yields a one-time benefit of $3.4 billion during construction and recurring annual benefit of $60 million after that. What about the costs? No development costs accrue to the government, but there are environmental costs. According to the SEIS, burning this oil will release between 147-168 million tons of carbon emissions -- what does that cost? Enter the Social Cost of Carbon (SCC). The SCC was developed by a federal Interagency Working Group (IWG). It is an unfortunate name, because it suggests that these costs are artificial. Perhaps another name like the carbon impact cost "taxpayers will pony up" more accurately reflects reality. According to the EPA, the social cost of carbon includes "the impacts of global warming on agricultural productivity and human health, loss of property and infrastructure to sea level rise and extreme weather events." Think rebuilding after Hurricane Sandy, the National Flood Insurance Fund, and various drought relief bills in Congress. The IWG puts the SCC at $43 per ton. (Well, technically it is $38 in 2007 dollars -- sure would be simpler if "a buck was a buck.") Other studies have put the carbon cost at $77 a ton or more. A recent study out of Stanford, put the SCC at about $220 a ton -- five times the IWG estimate. Two notes of caution about this variability. The Integrated Assessment Models (IAMs) that combine climate and economy, are complex and we are still learning as we go. It would be a mistake to assume the variability makes the cost of carbon illegitimate. That would be the proverbial "throwing the baby out with the bathwater." Also, all other estimates for the cost of carbon are higher than the IWG's number, suggesting it might be conservative. For our purposes, let us stick with the GAO reviewed number of $43 a ton and the lower end of the emissions estimate of 147 million tons. This puts the annual environmental cost at $6.3 billion dollars. So after construction, the government will reap $60 million in benefits, and have an exposure to a loss upwards of $6 billion annually (over $32 billion, if one used the Stanford estimate). These damages are global -- we could assess the U.S.' share of the $6 billion to be $2 billion, using as proxy, the share of global economic losses per data from Swiss Re. These estimates represent the potential increase in emissions attributable to the proposed Project if one assumed that approval or denial of the proposed Project would directly result in a change in production. However ... such a change is not likely to occur under current market conditions. Their argument contends that the oil is going to be extracted and sold, irrespective of whether the pipeline is built. My friend Mark Hettel described it like someone saying, "If I had not driven the getaway car, someone else would have. So I am not really an accomplice." Just because it is challenging to figure out who is responsible and to what extent, does not mean that we abdicate responsibility. Mark's clever quip may be more insightful than apparent at first. How is proportional culpability determined in a crime? Under Washington criminal law, often, the accomplice is no less liable than the principal. Both are culpable for the crime if each did an act knowing it was in aid of the crime, even if his or her acts alone would not constitute the entire crime. Could this be the guide for how the costs should be allocated? Does this not also make us culpable for global damage? Getting back to the economics... One way of accounting for a potential loss, would be to insure against it. Even if we assume a $2 billion loss (a third of the $6 billion) and a 10 percent insurance premium, our cost of $200 million is over three times the benefit. I am no investment advisor, nor do I play one on TV, but a negative 330 percent return on investment is likely to inspire Jim Cramer to have a coronary. And this assumes one can even buy insurance for something like this. For how long would you be able to buy insurance for your car, if you commit to wrecking it every year? The really insidious issue is an assumption of inevitability. The SEIS deflects to a "market analysis" hiding behind the inevitability of the extraction of tar sands oil. But the future is not inevitable; it can be shaped. If we are to stay below the 2°C temperature rise, we have to reverse this sense of inevitability, whether it is in the guise of pragmatism or complacency. To aggressively pursue a low-carbon economy, the Keystone XL pipeline is not just as good a place to start as any, but better. It is an infrastructure project - yesterday's infrastructure. Halted pipeline construction in North Dakota, and wind turbines in the distance highlighting the contrast between yesterday's and tomorrow's infrastructure. 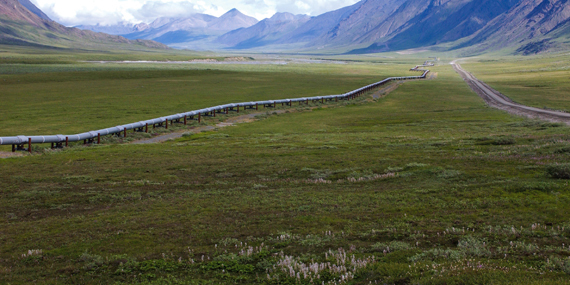 Copyright © TransCanada Corporation. All rights reserved. The post originally appeared in The Washington Monthly.